This page contains information on the trademarks and copyright protected artwork of Stage-Gate Inc, including logos, tag lines, product packaging and the content of this website. The Stage-Gate® brand, in particular, is one of the most recognized and trusted brands in the world. The trademark Stage-Gate is well-known for its long use in association with a best practice, high quality new product development process. 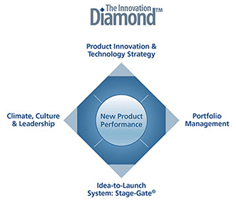 All of the trademarks of Stage-Gate Inc. share its reputation for standards of excellence, world-class performance and successful product innovation. Our trademarks help consumers identify the authentic products and services of Stage-Gate Inc., and thereby serve to distinguish us from our competitors. It is illegal to inappropriately use, identify, and/or reference trademarks, including the well-known Stage-Gate trademark, to promote competitive products or services. Words and/or images that are confusingly similar to our trademarks may also be illegal in such circumstances. The unauthorized use of any of our trademarks, or a mark that is confusingly similar to any of our trademarks, may lead consumers to believe that your product or service is managed, sponsored, or endorsed by Stage-Gate Inc.
You may use, identify and reference our trademarks, logos, tag lines, artwork, packaging or the content of this web site for the purposes of academic research, articles, user testimonials and case studies provided you comply with the General Guidelines for the Proper Use, Identification and Reference of Intellectual Property. Your use must not mislead consumers as to any relationship with Stage-Gate Inc., including sponsorship, affiliation, or endorsement of your company, or your products or services. 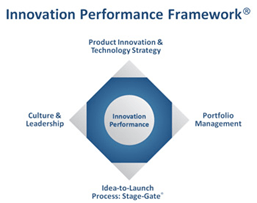 As a result of our investment in research and innovation, we have created a portfolio of many valuable brands including Stage-Gate®, Product Development Institute®, SG Navigator™, Benchmarker™, Innovation Performance Framework®, Basic 8 Framework™ and many more. Below is a list of our trademarks, logos and artwork. The omission of a word, logo, tag line or art work from this list does not constitute a waiver of any and all intellectual property rights that Stage-Gate Inc. may have in them. 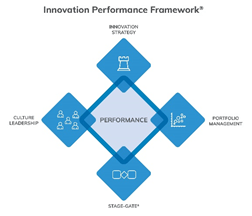 Innovation Performance Framework ® Framework: World Class Product Innovation Program illustrating the four, integrated points of product innovation performance: Innovation Strategy, Portfolio Management, Culture Leadership and Stage-Gate. Below is a current listing of the logos and taglines associated with our products and services. ® Logo for Product Development Institute Inc.
Below is a current listing of the artwork associated with our products and services. You may reproduce, identify and reference our trademarks, tag lines and artwork when used in an academic environment or for the purposes of user testimonials and case studies provided you comply with these guidelines. This permission is an expression of our trust. Your use must not mislead consumers as to any Stage-Gate Inc. sponsorship, affiliation, or endorsement of your company, or your products or services. Set the trademarks apart from other words or nouns they modify. The common way to do this is to capitalize the trademark, correctly spell the trademark, use the appropriate trademark symbol and appropriate descriptor. You may also underline, italicize, or bold the name. For example, the following are inappropriate ways to reference the trademark Stage-Gate: stage-gate, Stage/Gate, STAGE GATE. Instead, the appropriate ways to reference the trademark Stage-Gate are as follows: Stage-Gate® in the first instance and Stage-Gate or STAGE-GATE in all subsequent instances. Use the Authorized Link Logo or Text Link for Web Pages/HTML Documents. When referencing and/or identifying our trademarks on web pages or in HTML documents, we request that you include the authorized link logo or create a text link to the appropriate web site. Link Logo – Download the authorized link logo (right click the graphic shown to the right of this text, copy and paste). The link logo is linked to the official website of Stage-Gate® at www.stage-gate.com. Place the link logo within close proximity to the trademark(s). For example, immediately to the right or left of the trademark when a trademark is referenced only once, in the footnotes or endnotes when a trademark is referenced several times on one web page, or in a visible location on each web page when the trademark is referenced on several different web pages. Text Link –Hyperlink the trademarked name to www.stage-gate.com. For example, highlight the trademark name, right click and select hyperlink. Type in www.stage-gate.com. All content displayed on www.stage-gate.com in association with any of our products and services is subject to copyright protection, including trademarks with logos, artwork, the contents of our web sites and product packaging. It is illegal to copy or modify, distribute, display, license, or sell any of the content contained in them without the expressed written permission of Stage-Gate Inc..
Can I use one of your trademarks, such as Stage-Gate, to indicate that my product or service is similar to or can be used in the product innovation process? No. Such use could lead customers to believe that your product or service is managed, sponsored, or endorsed by Stage-Gate Inc. Your product or service will be required to demonstrate defined performance standards before it is eligible to display one of our trademarks or logos. If you do not have a signed agreement specifically for the use of our trademarks or logos, you may not use any of our trademarks or logos. Can I use one of your trademarks to inform our stakeholders that we have officially acquired and implemented one of your products/services (example: Stage-Gate®, SG Navigator™)? Yes. You may reference Stage-Gate Inc. trademarks and logos provided the reference complies with the above guidelines. Can I use one of your trademarks in my academic research, report, seminar presentation and/or article project? Yes. You may reference one of our trademarks provided the reference complies with the above guidelines and the project is displayed, used in, or directed to a non commercial (i.e. academic) environment. Can I use the text and/or images found on the official website of the Stage-Gate® Model ( www.stage-gate.com,) in a report that I am preparing and delivering to people within my company? Can I use your trademarks, logos, tag lines or artwork on merchandise such as clothing and coffee mugs that I am preparing and delivering to people within my company to internally promote our company’s adoption of your products or services?